As the name suggests, CRMs were originally designed to help businesses build and maintain relations with new and existing customers. Today’s CRMs have grown into robust tools that help organizations with sales management, point-of-sale, marketing, accounting, and vendor data management. A CRM will help you find leads, follow up with prospects, and nurture them into buying customers. Beyond that, it also helps to cultivate customer loyalty. You need a robust contact management system – at its core, a CRM is all about keeping information from different sources in an organized manner so that it is easily available when needed. You’re looking for an automated way to boost sales – the latest CRM systems can help with lead generation, prospect nurturing, email marketing, sales invoicing, order tracking, sales forecasting and so much more – all of which are be invaluable in sales and marketing. You’re looking for an effective way to better customer support – since CRM tools store critical customer information such as purchase information, past interactions, personal data, and order information, your sales team will have a strong point of reference when providing customer support. There are at least four categories of Customer Relations Management software with each category boasting several competing providers. They are: small business, social, mobile, and enterprise CRMs. Mobile CRM products, for instance, are excellent for industries where sales reps go to the clients – not the other way around. These CRMs incorporate geo-location features which help reps plan quickest routes between multiple contacts. Small business CRMs, on the other hand, are designed specifically for niche markets with limited budgets. If you’re a small business, it’s important to choose a tool suited to small businesses. See also: What is an LMS and How Can Your Small Business Benefit From It? Implementation – how easy is it to deploy the system, including testing and user training? User adoption – is your sales force receptive of the new platform? Compatibility – can the CRM seamlessly interface with other applications you run (such as accounting software) without major adjustments? Customizability – CRMs are created to perform a multitude of functions. Yet, everyone’s processes are different. Can you adjust the the one you're looking at to fit your processes? 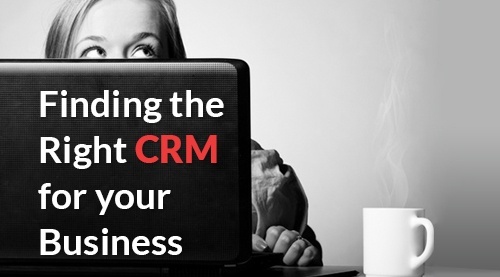 By the time you’re through with the fourth step, you should be able to choose a CRM that best suits your business. Go ahead and deploy it and watch your business scale to new heights!